When people consider careers that graduates from Wilfrid Laurier University’s Human Rights and Human Diversity program might pursue, most minds probably conjure images of humanitarian work in far-flung lands. For recent graduate Shelby Do, the journey to meaningful work in her field was much shorter than that. Do landed a job close to home following a 16-week internship at Brantford's Lansdowne Children’s Centre, an organization that supports children and youth with physical, developmental and communication needs, as well as their families. 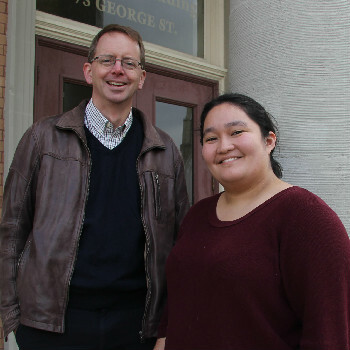 Do says her internship at Lansdowne proved a valuable learning experience. "You are a lot more capable than you realize." “I didn't think I was overly capable when I went into the internship, but I found out that I am,” says Do. “I learned you don’t need to know everything going in and you have a lot of skills from high school and university that will carry you through. Shortly after finishing her internship, Do started as the fund development officer at Lansdowne Children’s Centre Foundation. In her position, Do writes grants, seeks donors and sponsorships, and manages marketing and social media. “I feel as though Laurier helped me develop a passion for working with non-profits, as well as prepared me for writing persuasively, which assists with grant writing,” she said. Associate Professor Andrew Robinson, Human Rights and Human Diversity program coordinator at Laurier’s Brantford campus, secured two 16-week paid internships for students in his program with the help of the Province of Ontario’s Career Ready Fund. One of those students was Do. Robinson says the internships offer an opportunity for the university to engage with the community and for students to gain real-world experience. He says Do's story is a great example of the diverse options for graduates of Laurier's Human Rights and Human Diversity program. For the Brantford-born and raised Do, the internship was a way to give back to her community. The idea of working with a non-profit such as Lansdowne excited her. Angee Turnbull, director of philanthropy at Lansdowne, says Do’s contributions as an intern and employee have been highly valued. “Considering everything that Laurier and Brantford have given me, the least I can do is to give back because it's my home,” says Do. In the fall, Do returned to Laurier’s Brantford campus to share insights and advice about her experience with a group of political science students visiting from Assumption College School, the same high school from which the Laurier alumna graduated. Learn more about the numerous experiential learning opportunities at Laurier such as community service learning, co-op education, field courses, internships, and more.